CARSON CITY, Nev. (AP) — Aiming to rein in soaring prescription drug prices, an unlikely Nevada coalition is trying to force pharmaceutical companies to disclose how they set insulin prices — and issue refunds to diabetics or their insurance companies if annual price hikes surpass inflation. Las Vegas casino owners have banded together with their employees’ unions of cooks, servers and other resort workers to support the unprecedented legislation in their effort to control their own medical insurance costs. The bill expected to face its first vote in early May would attempt to cap how much employers, insurers and corporate middle men pay for insulin, which is injected to manage blood sugar levels. Lawmakers also hope the bill would cap what diabetics pay out of their own pockets near their current cost levels — typically between $50 and $600 per month, depending on diabetics’ insurance coverage. It remains far from clear that the bill, if passed, would survive legal challenges or have the intended effect. But it would make Nevada the first U.S. state to force detailed release of drugmakers’ proprietary information and effectively establish a price control on prescription drugs via the refund plan. The bill is expected to pass in both houses of Nevada’s Democratic-controlled Legislature. Republican Gov. Brian Sandoval, in an interview with The Associated Press, did not rule out signing it. 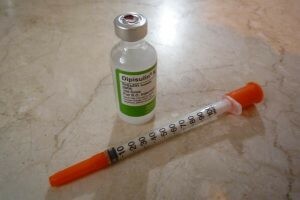 The move in Nevada illustrates public ire reaching critical mass over price hikes on insulin, epinephrine, antibiotics and other common prescription medicines, said Steve Brozak, president of the New Jersey-based WBB Securities investment banking firm, which focuses on health care. Brozak and other industry experts warned against assuming government intervention would result in lower pharmacy bills, and said drugmakers would likely sue to block the law. They said price constraints could have unintended consequences. “I don’t think this will work in the way people think it will, but this could be the shot across the bow,” Brozak said. The bill would trigger reimbursements to insurers and others who pay for diabetes-related drugs when price increases outpace the national Consumer Price Index Medical Care Component, which rose between 2 percent and 5 percent each of the last 10 years. “There is no question that lives are at stake and that, every day that people have to make the choice between their medicine and putting food on the table, we go further down the road to reaching a true public health crisis,” said bill sponsor Sen. Yvanna Cancela, former political director with the Culinary Union 226 lobbying for the bill’s passage. The pharmaceutical industry argues that basing refunds on sticker prices would be ineffective because those rates constantly fluctuate and the market is much more complex than bill supporters say. Drugmakers also say prices reflect research costs and point a finger at insurance companies that have drastically increased co-pays and deductibles. Nevada’s casino owners and unions representing casino workers have long opposed each other in wage proposals but formed their rare lobbying partnership after reviewing costs in their negotiated health care plans. Insulin and other diabetes medications represent 21 percent of prescription costs for the casino unions’ 57,000 Nevada members, and increased 21 percent from 2015 to 2016, said Bobbette Bond, health policy director at Unite Here Health, which oversees Culinary Union 226 health plans. About one in every 11 Nevada residents had diabetes in 2014, similar to the national average that year, according to the Centers for Disease Control and Prevention. Jacobo Perez-Jimenez, a Las Vegas cook who has diabetes, said a monthly bottle of insulin cost him $7 in 2011. Now he pays $75. The Nevada effort comes less than a year after the pharmaceutical industry won a major victory against prescription drug price controls in California. Ohio voters will consider the same proposal in November. Lawmakers in about half of U.S. states have made some attempt to curb prescription drug prices. Vermont last year adopted a law asking drugmakers to justify certain price increases of 15 percent or more, and California legislators are now seeking notification of price hikes above 10 percent. The Nevada bill would mark the first time drugmakers would be required to publicly detail business data about specific drugs including research costs and discounts they give insurers, pharmacy benefit managers and wholesalers. Supporters claim disclosure will prompt manufacturers to lower prices, but market experts said there’s no guarantee the idea would work and the notion disappoints some consumers who want immediate action.